This is the Gran Torino emblem on the grille. Plain Torinos had no emblem, and Gran Torino Sports had a different one than this. 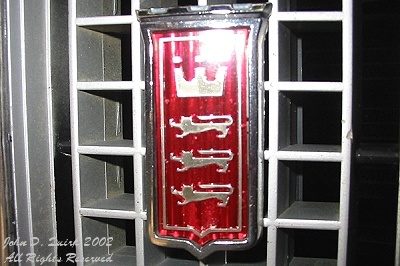 If you have one of Ertl's 1/18th scale die-cast Gran Torinos, look at the grille emblem with a magnifying glass. You'll see the three lions and the crown - truly amazing detail.